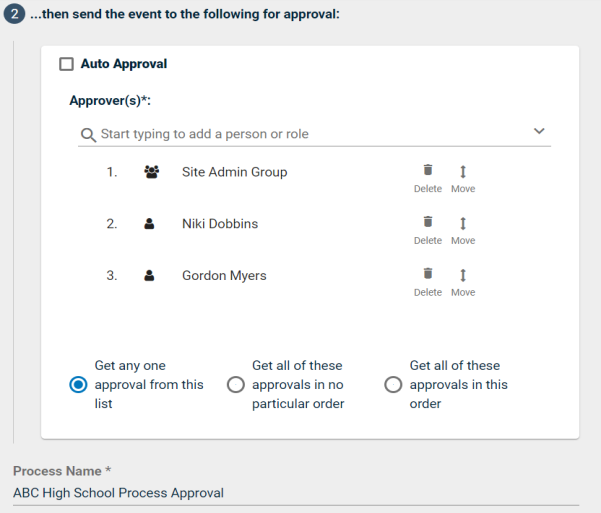 The Approval Processes page is where you can view and edit the people who need to approve events for your sites. These events will not show on the calendar until they have gone through the approval process listed on this page. Every Event Manager account includes a Default Approver process, which can be edited. Clients who have Advanced Approval Workflow in their account will also have the ability to create new approval processes, which can be filtered by Location and/or Category. *Note: The Advanced Approval Process feature is currently only available as a part of a pilot program. To learn if you are eligible for this program, please contact Client Services. Click on Settings in the side navigation menu. Under the Calendar Settings section, click on Approval Processes. Click on Create a New Process. *Note: This button will only appear if you have the Advanced Approval Process feature. By default, the Type will indicate that This is a Site Approval Process. If this approval process should be applicable to all sites, select This is a Global Approval Process. In Step 1, the route can be focused to a particular Location and/or Category. In Step 2, specify the user or user group you want for this site's approval process. *Note: You can check the Auto Approval checkbox instead of selecting specific approvers. When this box is checked and the conditions in Step 1 are met, the event is automatically approved and is published directly to the calendar. Search for the user or group's name. The name will populate below the text area. Click on the name to add them to the list of approvers. Repeat this process for all users or user groups who should be included in this approval process for this site. Click Move to drag a User or Group to a different step in the order of approval. Select the appropriate option you'd like to use for this approval process, whether it be one approver, all approvers, or all approvers in the specified order for the event to be approved and added to the calendar. Enter a Process Name so it can be easily identified in the list of approval processes. If applicable, check the box next to Do not allow this rule to be overridden. Checking this box ensures that a user cannot choose to publish the event by bypassing this approval process. Click the Save button to return to the Approval Processes screen. The site's default approval process will be listed on the Approval Processes page, and will vary based on whether the site was added before or after the Approval Process feature was released. For any sites that you had in your account prior to the approval process feature, you will see the Default Workflow Approver Group listed in the Approver(s) section. This group includes anyone who's site permissions enable them to approve an event at this site. For any sites that are added after the approval process feature, the list of approvers will include any Tenant Admins in your account. If you have more than ten Tenant Admins, the list will include the first ten in order of when they were last added or modified. You have the ability to edit who is included in the approval process, or even determine in what order the event should be approved. When editing the list of Approvers, we recommend adding the users you want included in the approval process before deleting the users you don't need in the approval process. This ensures that there is never an empty Approvers list. Click the Edit button next to the approval process for which you want to update the list of approvers. In Step 1, the route can be focused to a particular Location and/or Category. *Note: The Advanced Approval Process feature is currently only available as a part of a pilot program. To learn if you are eligible for this program, please contact Client Services. Once you have added all applicable approvers, you can click the Delete button next to any user or group that no longer needs to be listed in the approval process. You can also click Move and drag a User or Group to a different step in the order of approval. If necessary, edit this Process Name so you know which approval process this is referring to.